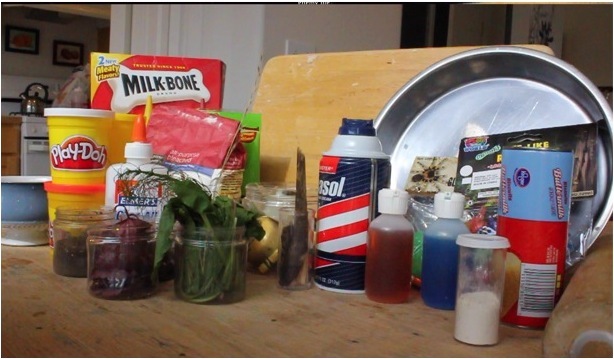 This is all part of the Enemy Pie Experiment, a presentation I do on author visits for kids in grades K-3. I ask a few questions, read the book, and then the kids get to work finding the best way to get rid of an enemy. They make a good pie, then a bad pie, and decide which one does a better job achieving their goal. 2) Playdoh is your friend. You will most likely hear ideas that you hadn’t anticipated. Let your students make those things with the Doh. And for liquids, let them mix vials of colored water. -When a student is making an ingredient out of playdoh, give them enough to share with their neighbors. It gives you a few more active helpers and it’s a good little instant community builder. – If any of your students are having “friendship issues,” try to give them a big role in the pie making activity. (Rolling out the dough, putting on the whip cream, and putting on the shaving cream are highly coveted jobs…) Even if it’s just for 30 seconds, these students will actively associate fun and joy with the process of conflict resolution. that can be powerful stuff! 4) Divert the horrendous. 99% of the time, student answers are non-controversial. But for the over the top ones… Don’t do fake poo. And fake blood is pretty creepy too. When kids start pushing that envelope, meet them halfway with kitty litter or ketchup. In my experience things go rapidly downhill whenever that line-of-disgust is crossed. 5) Test out pie theory. After the pies are made, do a walk through to see which pie works best. Set the stage for your kids giving the bad pie to their enemy. What would happen after they took a bite? (telling them “DON’T SAY DIE” definitely helps keep the experiment on track) Then try the same scenario with the good pie, and vote on which method worked best. That’s it in a nutshell. Below I’ve added a list of basic ingredients and items that you’ll need. 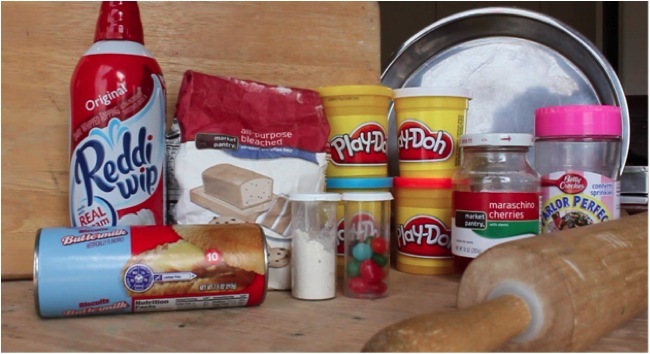 playdoh – red is used the most. blue next, then yellow. I know this presentation requires a bit of prep time and a fair amount of energy. But holy smokes- it’s so worth it. It’s a blast to do, the kids love it, and the hands-on lesson on conflict resolution is easy for kids to get. Or, invite me to your school and I’ll do it! I offer this presentation and a number of others at my school author visits. It’s easy to set up! Click here to learn more. And if you do decide to do the experiment, please drop me a line and let me know how it went!